Wall Street is predictably overreacting to the unpleasant payroll report. It is understandable in a way since, as noted yesterday, the Establishment Survey and the unemployment rate are all that is left to suggest the economy remains on track and any weakness would be temporary. It was a strained position to begin with, especially since the economy shifted lower almost two years ago and really took “temporary” off the table. Still, there is great emotion attached to the BLS’s headline numbers. Stock markets slid sharply on Friday and the dollar fell after U.S. non-farm payrolls numbers came in well short of forecast, adding to concerns over the pace of economic growth that have weakened investors’ appetite for risk globally. Futures prices showed Wall Street set to open as much as half a percent lower while stock markets in Europe deepened morning falls, sending global indices towards their worst weekly losses since early February. The monthly numbers reflected that characterization, with the Establishment Survey gaining just 160k, just barely above the revised gain for January and the lowest monthly estimate since last summer’s widespread introduction to uncertainty. 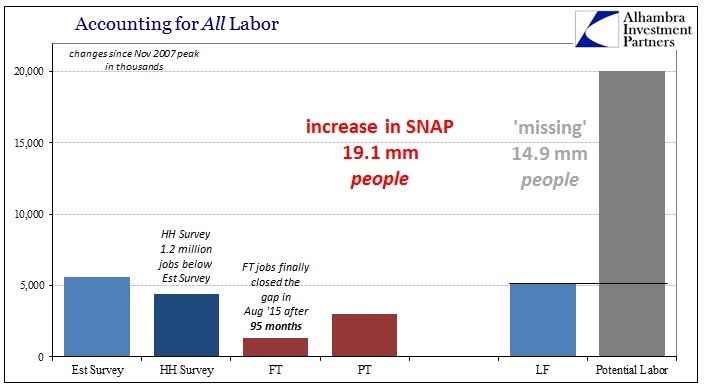 Calculated employment via the Household Survey fell by 316k after an enormous run, which was reflected in the official labor force tally that dropped by 362k after adding an (literally) unbelievable 2.4 million in the six months before. Without any standout bright spots, caution and concern may well be the most warranted interpretations. In broader analysis, however, this payroll report isn’t any different than the last (or the one before it, and so on). There is very little value to begin with in trying to parse monthly variation, reflected in a wide confidence interval at just 90% confidence. For all we know the jobs market in April 2016 was exactly the same growth as March 2016 when everyone was far more pleased. What we really don’t know is whether both March and April should have everyone elated or seriously worried (obviously, the rest of the economic data points uniformly point to the latter). That is because the payroll figures lost their bearings some time ago, in late 2013 or at the start of 2014. Because of that, they provide nothing but estimates of variation around a benchmark that bears no resemblance to the actual economy. As such, the monthly payroll report remains irrelevant equally when it is bad as when it is taken as good. There are several ways in which can see this bias, the historic labor force surge that began last October being the most obvious. There is absolutely no reason to suggest that Americans rushed to look for jobs all of sudden right after the first big rumbles of both economic and financial decline. In specific industries, the estimates of labor subsets also contradict economic data found elsewhere. Where US factory orders, for example, agree in almost exact unanimity with US imports and thus project a very weak and likely contracting US “demand” environment, the BLS’s estimates for US factory workers shows these questionable inconsistencies. Factory orders, as US imports, slowed considerably starting in early 2012. The BLS series for manufacturing employment reflected that weakness in relatively short order; within just a few months. 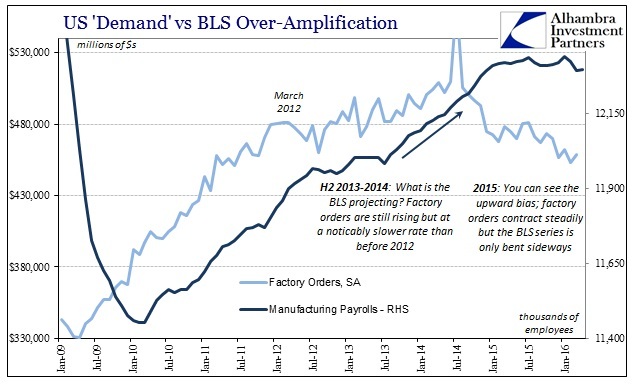 While that slowdown in orders (and other measurements of sales and activity) remained relatively constant, the BLS for some reason gives us a renewed surge in manufacturing jobs starting during the taper drama summer of 2013. That upward trend kept going until late 2014/early 2015 when factory orders had already fallen off rather sharply. For that continued contraction, lasting now 17 months in orders, the BLS only figures an end to the hiring binge and then a very slight cut (-39k from the peak level in July) in manufacturing employment. 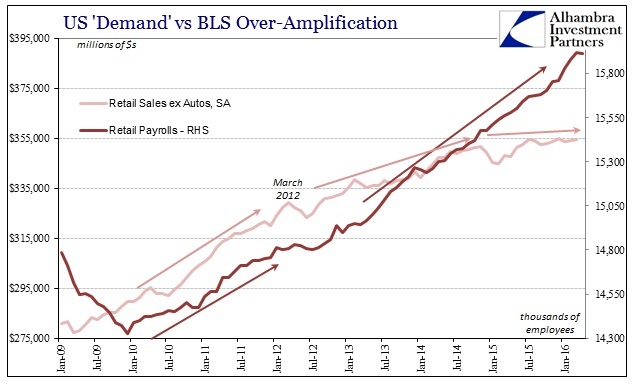 Where prior to the middle of 2013 both the BLS and Census Bureau data were largely synchronized (factoring in lags), after 2013 there has been an obvious upward bias in the employment estimates running contrary to the lingering and then amplifying slowdown/contraction in factory orders. That disconnect, however, pales in comparison to what we find in the employment numbers figured for the retail industry. Retailers, according to the BLS, have been hiring at an unprecedented rate recently even though retail sales (including autos) have been depressed for more than a year at levels usually consistent with full-blown recession. Like the Household Survey and Labor Force estimates, payrolls in the retail industry were finally believed to have declined in April if only slightly. Where the BLS shows retailers adding an incredible 237k jobs during the labor force’s epic surge, they only presume a 3k decline in April, which is the first, supposedly, since December 2014. 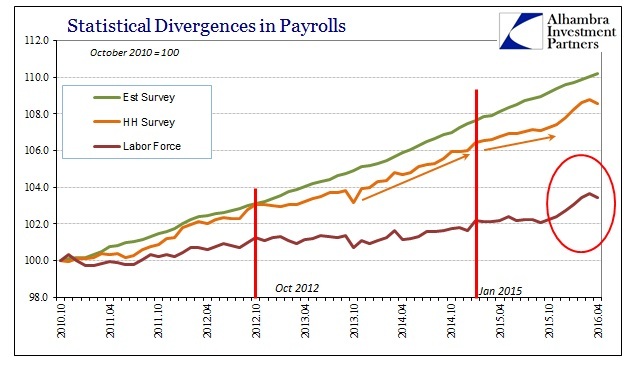 This payroll report just does not suggest anything has changed. Like those that have come before it, dating as far back as 2014 and maybe even 2013, it tells us very little about what the true state of the labor market might be. The evidence of serious upward bias remains, as does its inconsistency with a very, very broad range of other data including incomes and wages. “The labor market has been a shining beacon compared with other elements of the U.S. economy for the past few months, but no longer,” said Dennis de Jong, managing director of London based broker UFX.com. If it was a shining beacon, it was a ray of light that has been pointing in the wrong direction for a very long time. What might be significant is that more and more people are starting to realize it, which is likely the only significance of this one month’s ugliness.